Well, I can never see a Rose wine in my life again without remembering my grand father. He was the maverick of his time and had the audacity at the ripe age of 75 to dream of bottling his own vin biologique right there on the family’s estate. That wasn’t exactly common in those days back in the Languedoc 1975- 78 – but totally in alignment with his career as a professor of medicine, dedicated to “First doing no harm”. 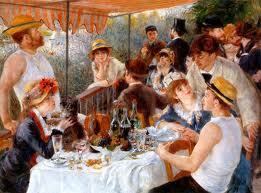 In any case, I can see him sitting around our family’s table under our iconic 100 year old pine tree, in la Bousquette, a scene somewhat reminiscent of Renoir famed painting- I can see and hear him, smacking his lips in satisfaction as he would taste up the new vintage of the chateau bousquette rose, friends and admirers surrounding him, like they would typically at summer time, come visit with him for aperitif. He’d then exclaim ever so proudly ” Now that is a rose, just the way it should be and you are not going to get a heartburnt from this either ! No crap whatsoever in this wine! ” And friends and relatives would nod approvingly and perplexedly: yes, they had noted to that this was the only Rose that they could enjoy on a hot summer south of France day without getting heartburnt. And off they would drive later on with a couple of cases of that delightfully dry & unique beverage. I can see this scene just as though this was yesterday although 30 years + have gone by. Funny what one’s memory bank registers and what it forgets, not necessarily related to the apparent importance of the event. But my own 80 year old grand father, proud of his accomplishment, proud of his most recent innovation, smacking his lips and sharing the moment with people he loved, that is for ever stuck in my mind . The sight, the sounds and the sensations all aligned in the moment, the heat of the garrigue, the scents of that surrounding garrigue penetrating into every bit of our old family house. — wrapped up in a feeling of admiration & astonishment that a man that age could still feel that passionate about something seemingly insignificant. But for him, for the healer in him, the fact that his wine did not cause heartburnt had the profoundest of meaning. He was right. I intuited that then, I know that now. 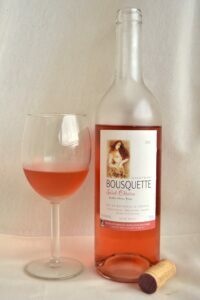 Try our Chateau Bousquette Rose, I think you will love it too.